I don't usually post craft ideas this far in advance, but I had some trouble finding the supplies to make more of these and I thought others might need a little lead time if they encountered the same difficulties. St. Anne is a favorite among most Catholics. My kids read in one of their daily saint books that she is called St. Grandma by some. She was a favorite of my grandma's and her and her husband's feast day is my husband's birthday (with patrons like that I knew he would be an amazing father : ) And since Sts. Anne and Joachim are the patrons of grandparents, what a great day to dust off the old photo albums and share them with your children. I also wanted to make a special craft for the kids to help them really grasp the notion that these were Jesus' earthly relatives. Originally, I was thinking of making a frame collage with pictures of Our Lord's earthly relatives similar to what most grandmas have on some wall of their house but that started getting very involved. So I was walking around the craft store praying for inspiration when I saw these paper mache book boxes. An idea. 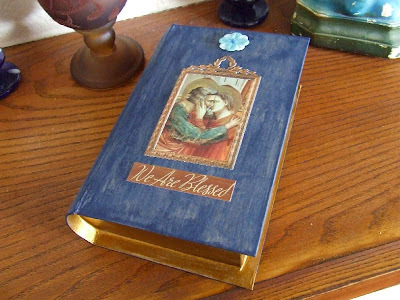 A photo box... decorated with pictures of Sts. Anne and Joachim, the Blessed Virgin and Our Lord (and St. Joseph too since he was their son-in-law). BTW.. .my mother-in-law, who has bought and sold many houses, believes that if you really want to sell a house, you should pray to St. Anne to nudge St. Joseph because nobody nudges like a mother-in-law! 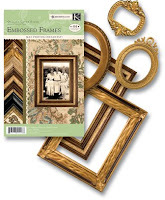 I also snagged a package of these embossed paper frames from the scrapbook aisle to dress up the pictures I wanted to use and a sheet of cardstock stickers with a Christian theme. First you paint the outside of the box with a deep blue using a dry brush technique. That's just where you use a little bit of paint on your brush and paint it on in streaks. This created an antique finish. Then paint the sides of the book (the part that looks like pages) using a metallic antique gold paint to give the impression of gilded edges. The inside of the box could be painted the same as the outside, but I chose a wine color for contrast. The hardest part was printing out pictures that fit inside of the tiny little paper frames, but once I got the sizing right, they just glued on with a glue stick. If you want to print the pictures I used, you can find them at Scribd. Here is the inside: It is pretty enough to be displayed on it's own but also very useful as a holy card keeper. We have added what holy cards we have that aren't on our holy rings to the box like St. Anne adding pictures of distant relatives. Now, if you are going to contemplate Mary's side of the family tree, we must not forget St. Joseph's. His family was part of Our Lord's earthly family too. So, if you missed it the first time, listen to the adorable song from Andrew Peterson called The Ballad of Matthew's Begats and just try not to tap your foot or sing along! 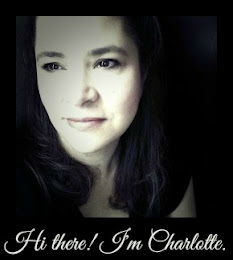 This is lovely, Charlotte! The pictures are helpful! We can't wait to get started! What a brilliant way to celebrate St. Anne's Feast and continue to remember her throughout the year. We were envisioning using St. Anne's box to hold special prayer intentions that we would ask St. Anne to intercede especially for. Charlotte, this is wonderful! I'm glad you posted this early like this -- gives me time to gather the materials and plan ahead. You ARE so creative! What a lovely art project. My Anna sends you a big hug for such a lovely idea to help her celebrate her feast day and to honor St. Anne and Joachim! Charlotte--It really is so lovely. I can't wait to do this with my kids this month. Thanks for posting in advance so we could get the visual. It really does help. Brilliant, Charlotte! I love it! I really like this idea. And I was right, I am not the only one "scrapbooking with the saints." :) St. Ann is my patron too. 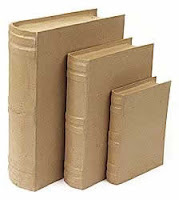 I doubt I will be able to find the paper books though; I will modify this idea dependant on what I can find. I LOVE it! I'll link it to Starry Mantle when I blog nine days straight leading to St Anne's feastday! Wonderful! 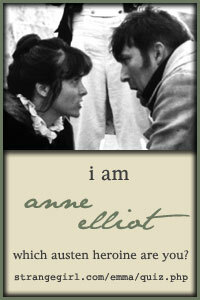 We are big St Anne fans here, this is perfect! I just got home from a full day in town and SAW those boxes at Michael's... I almost bought one, and now I really wish I would have!!! Your box is BEAUTIFUL!!!!! The boxes are lovely. And your ability to think how to use them is extrodinary. How I wish we had access to so many of the craft materials you US ladies have. I will have to come up[ with some sort of alternative. Are all your images from the internet or your colouring pages? God bless you for sharing this well thought-out craft --and indeed all your clever ideas! I know my second daughter, GraceAnne, will especially love making these in honor of her patron saint. My coloring pages are all my own work but are based on images I have found online. I take a picture from online and turn it into a coloring page. They are free for independent family or school use, but not for sale. That's a good question. I had always heard his name pronounced JOE-uh-kim but recently I have heard it pronounced wah-KEEM. That sounds too Spanish to my ear. This website indicates that it is pronounced JOE-uh-keem. But a person familiar with Aramaic says here that it is properly pronounced yo-a-CHIM with a hard, gutteral ch sound. You know, I have a SIL who speaks Aramaic. I should ask her! Charlotte, I am so happy to see this idea. Thank you. 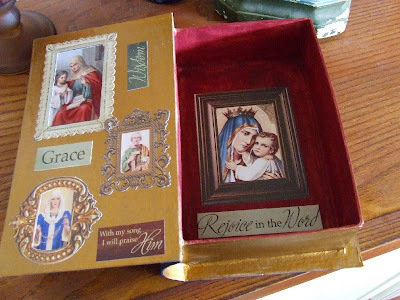 A wonderful gift idea for grandparents as a keepsake box or for any little girl named after St. Anne, LUV it! I love this idea... I think we will do a variation and make a mini-scrapbook. Thanks for the link to the pictures you used, too!